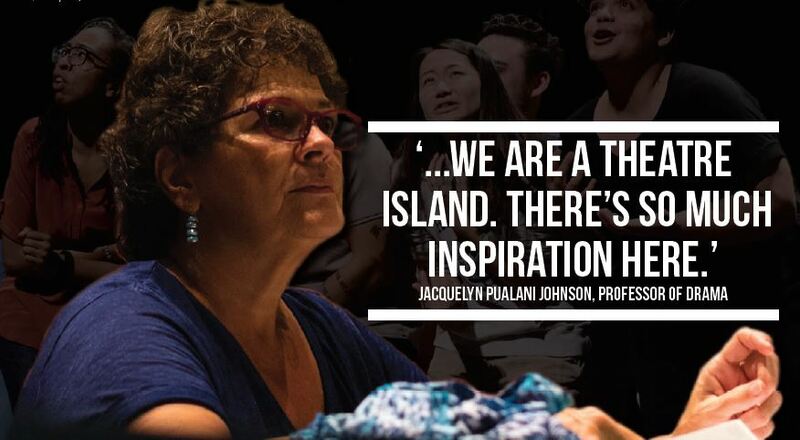 Jacquelyn “Jackie” Pualani Johnson, a professor of Drama and longtime fixture of UH Hilo’s Performing Arts Department, will be directing one of her final shows with the school this November. “Ghosts of Hiroshima,” which begins the coda of Johnson’s 37-year run at the University, combines acting, dancing, taiko drumming, and other media to tell the stories of the “hibakusha,” the name given to those who survived the 1945 atomic bombings of Hiroshima and Nagasaki. Johnson hopes to use this production as a vehicle to draw parallels between the use of nuclear weapons in the past and contemporary international developments. Having been born and raised on the Big Island, Johnson sees performance as an integral part of both her life and the life of the community. “We have wonderful theatre groups around our communities, around the island. So I can say it honestly, bold-facedly, we are a theatre island. There’s so much inspiration here,” Johnson said. Johnson hopes to use this inspiration to tell a relatively difficult story. Written in 1983, “Ghosts of Hiroshima” offers a chance to look through the eyes of those directly affected by the world’s first and only instance of nuclear warfare. As opposed to pure entertainment, which is expected from theatre, this production primarily serves to educate. Leah Wilson, a UH Hilo alumna and ensemble cast member in “Ghosts of Hiroshima,” reiterates the challenges of presenting such a controversial topic in an entertaining way. Wilson also reflects fondly on her time working with and learning from Johnson as a performing arts major at UH Hilo. For her final production, Johnson has chosen perhaps one of her most challenging. Dancer Sarah Dunaway tells how involved the choreography is, incorporating many different artistic elements. “There’s a movement where we use a parachute and it has to blow up. I think that’s one of the harder parts we have,” Dunaway said. This meaning and intensity is what “Ghosts of Hiroshima” hopes to impart upon its viewers. “We want to be entertained, we want to have fun, but we want to learn, and think, and be motivated to consider our world,” Johnson said. “Ghosts of Hiroshima” will perform Nov. 17, 18, and 19 at 7:30 p.m. and Nov. 20 at 2:00 p.m. at the UH Hilo Performing Arts Center.